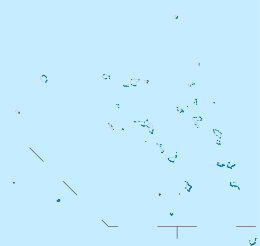 Mejit (Marshallese: Mājej, [mʲæzʲɛ̯ɛtʲ], or Mājeej, [mʲæzʲeːtʲ]) is an island in the Pacific Ocean, and forms a legislative district of the Ratak Chain of the Marshall Islands. Unlike most of the other islands of the Marshall Islands, Mejit is a stony island rather than a coral atoll, although it is surrounded by a fringing coral reef enclosing a narrow lagoon. It is located east of the main line of the Ratak chain, approximately 110 kilometres (68 mi) northeast from Wotje. With an estimated population of 348 people, the island is lush in pandanus, breadfruit and taro. To the residents, this island is known as 'Paradise". It has a beautiful fresh water lake (rare in the Marshall Islands) with indigenous ducks. Mejit is famous for its pandanus leaf mats. An airstrip, Mejit Airport, bisects the island. It is served by Air Marshall Islands. First recorded sighting by Europeans was by the Spanish expedition of Miguel López de Legazpi on 9 January 1565. It was charted as Los Barbudos (The Bearded in Spanish) because of the long beards of its inhabitants. Its sighting was also recorded by the Spanish expedition of Ruy López de Villalobos on December 1542. The German navigator Otto von Kotzebue, sailing in Russian service, made landfall at Mejit Island on January 1, 1817, and named it New Year's Island. In 1884 Mejit was claimed by the Empire of Germany along with the rest of the Marshall Islands, and the Germans established a trading outpost. After World War I, the island came under the South Pacific Mandate of the Empire of Japan. Following the end of World War II, it came under the control of the United States as part of the Trust Territory of the Pacific Islands until the independence of the Marshall Islands in 1986. Marshall Islands Public School System operates Mejit Elementary School. Northern Islands High School on Wotje serves the community. ^ Morison, Samuel Eliot (May 22, 1944). "The Gilberts & Marshalls: A Distinguished Historian Recalls the Past of Two Recently Captured Pacific Groups". Life. pp. 91–96, 99–101, at p. 93. Retrieved March 16, 2011. ^ "Annual Report 2011-2012." Ministry of Education (Marshall Islands). Retrieved on February 22, 2018. p. 54 (PDF p. 55/118). "Northern Islands High School takes students from the Ratak Ean zone including schools in Aur, Maloelap, Wotje, Ailuk, Utrik, Likiep and Mejit." This page was last edited on 18 February 2019, at 16:40 (UTC).